The passing of Ohio's Alternative Energy Portfolio Standards (SB 221) in 2008 set in motion a series of events that are helping spur utility scale renewable energy development in Ohio. In order to complement the Alternative Energy Portfolio Standards set forth in SB 221, Ohio has passed SB 232 to establish a tax treatment that further fosters the development and implementation of Ohio's renewable energy projects. This fact sheet describes the purpose and background of Ohio SB 232, including a discussion of the payment in lieu of taxes, local control, road and safety, CAUV implications, and the application process. Effective July 31, 2008, SB 221 established an Alternative Energy Portfolio Standard in the State of Ohio. This Advanced Energy Portfolio Standard requires that 25% of all kilowatt-hours produced by investor-owned electric distribution companies be generated from alternative energy resources by the year 2025. Alternative energy resources include both advanced energy resources and renewable energy resources. Advanced energy resources are defined as any method, modification, or replacement of equipment that increases the electric generation output of an existing facility without increasing the carbon dioxide emissions of that facility. Renewable energy resources are defined as energy created by using rapidly and naturally replenished sources that are virtually inexhaustible such as wind and solar (Ohio Revised Code 4928.66, 2008). While the Ohio's SB 221 is viewed by many as one of the more aggressive alternative energy portfolio standards in the United States, some argue the taxing structure in Ohio was counterproductive to the development of renewable energy generation projects. 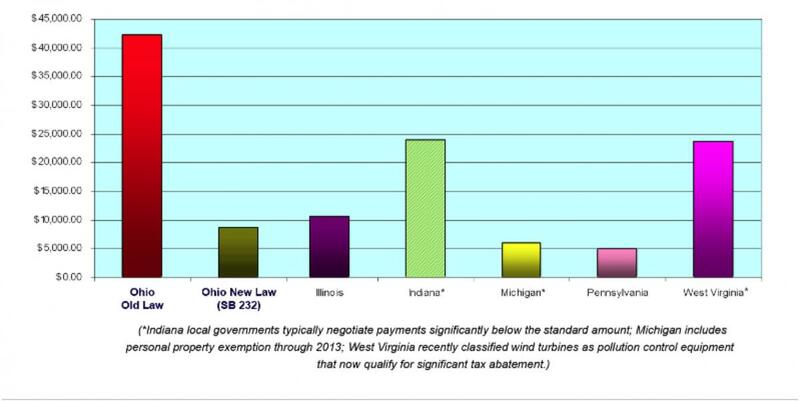 As illustrated in figure 1, when compared to other Midwestern states, including Illinois, Indiana, Michigan, Pennsylvania, and West Virginia, Ohio energy taxes were much higher, making it less attractive for advanced energy developers. As a result, on June 4, 2010, the Ohio General Assembly passed SB 232, which carried an emergency clause causing the law to take immediate effect. This new legislation offers tax advantages for development of alternative energy generation projects including renewable energy projects, clean coal, advanced nuclear, and co-generation. Under SB 232, qualifying renewable energy projects greater than 5 MW could be exempt from tangible personal property taxes and instead would be responsible for a payment in lieu of taxes (PILOT) to local schools and governments. The PILOT amount is determined by a combination of capacity and number of jobs created. Solar facilities will pay $7,000 per megawatt of nameplate capacity, while all other alternative energy projects pay between $6,000 and $8,000 per megawatt depending on the calculation of full-time employees during construction. In addition to the base PILOT fees, county commissioners can impose an additional service payment ranging from $3,000 to $1,000, with the total not to exceed $9,000 per megawatt of nameplate capacity in total (County Commissioners Association of Ohio, 2010). While the initial PILOT payment of $6,000, $7,000, or $8,000 will be circulated among the affected political jurisdictions per tangible personal property tax distribution, the additional service payments will be credited directly to the county's general fund. Pass a resolution making the entire county an Alternative Energy Zone that would automatically approve all PILOT applicable projects within the county. Make a determination on each individual PILOT application. Decline the application to participate in the PILOT program. Do nothing, which will have the effect of declining to participate in the PILOT program. As a result of the county commissioners' authority to approve or disapprove a PILOT application, open communication between township trustees, school board officials, and county commissioners is essential. County commissioners should expect input from affected townships, school districts, and area residents weighing in on whether to approve PILOT tax treatment of projects. Furthermore, it is important to note if a community declines the application to participate in the PILOT program, the community still has the ability to negotiate enterprise zone agreements on the tangible personal property tax and the real property tax with the project developer. When analyzing the community impacts of renewable energy projects, it is vital to consider the impact on existing infrastructure, more specifically, local roads. One of the many noticeable differences between solar and wind is their impact on roads. Wind projects involve components that are extremely large and heavy such as the towers and blades. Transporting these massive components often negatively impacts roads and could require the movement of existing utility lines. Conversely, raw materials required for solar projects are much smaller and can be shipped on standard 53' trucks. For projects greater than 5 MW, SB 232 obligates project owners to post a bond ensuring funding for the repair of all roads, bridges, and culverts affected by the construction, restoring them to their preconstruction condition. In addition, projects larger than 5 MW require project developers to provide safety training to local community fire, EMT, and rescue departments (Bricker & Eckler LLP, 2010). Current Agricultural Use Value (CAUV) is a differential real estate tax assessment program that allows owners of farmland the opportunity to have their parcels taxed according to the land value in agriculture, rather than full market value. However, if land is converted from agricultural production to a use inconsistent with the CAUV criteria, the Ohio Constitution permits the recoupment of funds by levying a charge on the affected land in an amount equal to the tax savings during the three tax years immediately prior to the year in which the land conversion occurs (LAW Writer® Ohio Laws and Rules, 2003). However, SB 232 allows the installation of an energy facility on land devoted to agricultural use and will not cause the remaining portion of the property to be regarded as a conversion of agricultural land from agricultural use for CAUV purposes, as long as the remaining portion of the tract continues to be devoted to agricultural use. Furthermore, a three-year CAUV tax recoupment penalty will not be levied for the conversion construction of an energy facility (Bricker & Eckler LLP, 2010). In order to qualify for the tax treatment, a project must be under construction (or filed with the Ohio Power Siting Board) by January 1, 2014, and placed in service by January 1, 2015. Applications can be found on the Ohio Department of Development (ODOD) website (development.ohio.gov/bs/bs_qepte.htm). Potential applicants should review the application instructions and answer the preliminary questions to determine whether they should file an application to become a qualified energy project. If the project meets the requirements of the exemption, then the Director of Development will certify the project as a qualifying energy project (Ohio Department of Development, 2010). A construction progress report is required each year during construction indicating percentage completed and nameplate capacity. Reports also must be submitted each year after construction indicating nameplate capacity unless ODOD waives such a requirement. Ohio's new economic development strategic plan is a bold, practical, and forward-thinking plan that focuses on innovation and opportunity. This plan calls for a fundamental change to the course of Ohio's economy by purposefully redesigning the business climate to increase global competitiveness for Ohio's employers. In this strategic plan Ohio identifies Advanced Energy and Environmental Technologies as one of its targeted industries. The plan calls for specialized Targeted Industry Development Teams to be assembled to develop specific retention, expansion, and attraction strategies for each target industry (Ohio Department of Development). While some details of SB 221 and SB 232 can be debated, when analyzing overarching premises of the legislation, it undoubtedly supports the implementation of renewable energy projects as a component of Ohio's strategic economic development plan. Bricker & Eckler LLP. (2010, June). Green Strategies Bulletin No. 10-03. Retrieved July 23, 2010, from Bricker & Eckler: bricker.com/documents/publications/1929.pdf. County Commissioners Association of Ohio. (2010, June 6). 2010 Statehouse Report. Retrieved July 23, 2010, from County Commissioners Association of Ohio: ccao.org/userfiles/SHR20100604.pdf. LAW Writer® Ohio Laws and Rules. (2003, September 26). 5713.30 Agricultural land definitions. Retrieved July 26, 2010, from Ohio Revised Code: codes.ohio.gov/orc/5713.30. Ohio Department of Development. (2010). Business and Industry | Qualified Energy Project Tax Exemption. Retrieved February 25, 2011, from Ohio.gov: development.ohio.gov/bs/bs_qepte.htm. Ohio Department of Development. (n.d.). Executive Summary. Retrieved July 26, 2010, from Ohio's Economic Development Strategic Plan: development.ohio.gov/strategicplan/documents/Executive_Summary.pdf (no longer available online). Ohio Revised Code 4928.66. (2008, July 31). 4928.66 Implementing energy efficiency programs. Retrieved March 2, 2010, from Law Writer—Ohio Laws and Rules: codes.ohio.gov/orc/4928.66.